Format: Paperback book (170 pages). 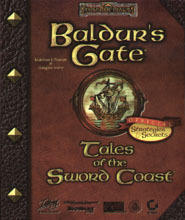 This official strategy guide provides hints on the Tales of the Sword Coast computer game expansion to Baldur's Gate by Interplay Productions. See also the Baldur's Gate official strategy guide published by Brady Games. Inside you'll find: Comprehensice maps and walkthroughs for every last crypt and causeway, In depth strategies for all new spells, objects and monsters, A detailed listing of powerful new friends and foes and a look behind the scenes at the making of the game. With weapon in hand and this strategy guide at your side, you'll cut a swath through your enemies and find a path to victory'.